Essential in Latin and Asian dishes. This special variety produces three times the amount of leaves over a much longer period, and is slow to bolt. Sensational aroma and flavoring for anything from salsa and Tex-Mex to Thai dishes — cilantro is complementary to any dish containing chiles. Bolted plants produces flowers that are attractive to beneficial insects, so leave them be after they’re done producing leaves. Plant every two weeks all summer for a constant supply. Photo courtesy of Baker Creek Heirloom Seed. Start indoors: Not recommended, as cilantro does not transplant well. 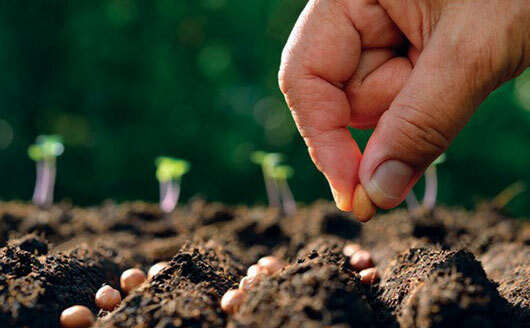 Sow outdoors when soil temperatures reach 60º. BEST ANSWER: Deer do not like cilantro in any way, shape or form. It almost acts as a deer repellent. HI. It is 25 degrees and snow and frozen ground. Seeds are nice and warm inside my home, still in the seed pkts. My cilantro always dies, so take my review with a grain of salt. The flavor and scent is fantastic, exactly what I expect from cilantro, but the production is just not there for me. I tried starting indoors and had a lot of success, but all seedlings died the first day I put them outside. Heat wilted them all in 2 hours. I have a fall planting in the ground now, but there may not be enough growing season left to get any yield. Next year I will plant a 3' row of just cilantro, direct-sowed outside and hopefully get a better yield.